• Spent four years building 12-unit condominiums, for homeless beetles, out of egg cartons. • Have a special pilot’s license that certifies that I am qualified to fly a kite. • Spent two years lobbying the government for legislation that would require all popsicle boxes to contain more grape-flavored popsicles than any other flavor. • Spent five years genetically engineering pinecones to be less prickly. • Can spit grape seeds over 6 feet (on a windy day). • Can get to the center of a tootsie-roll pop in under 75 licks. Alright, time for you to vote for the best of these two colors. All those who end up voting for the winning color will receive their very own “Cougher” and a signed copy of “That Tricky Z.” The next round begins on Saturday, so get your votes in before then. Just for the record, those tips at the end of shoelaces are called 'aglets' (Phineas and Ferb, not just a great cartoon but informative as well). I vote for gray. It's my second favorite color. Plus I'm still upset about the fact that there are more grape Popsicles in the box than any other flavor. Purple all the way. I get confused on how to spell gray sometimes. Can I spell it 'grey' too? That's tough. I don't look good in purple though, so voting for gray. I'm running this particular battle round, so I'm not allowed to vote, which of course kills me, since Gray is my favorite color. But rules are rules, and TS mails me moldy peanut shells when I cheat. So I have to abstain, but please, please, do not let (gray) my (gray) comments (gray) influence (gray) your (gray) decision. Rep, you are cracking me up. Even if you are trying to cheat. Grey, gray is too institutional, purple is the color of the room I had to grow up in and I did not ask to. This is a hard one for me, I am not fond of either. I guess I shall have to go with purple because at least the color looks nice on flowers. PURPLE SCHLURPLE!!! MY FAVORITE-EST COLOR IN THE WHOLE WIDE WORLD!!!! awww, hell no...like purple can stand next to gray, even. 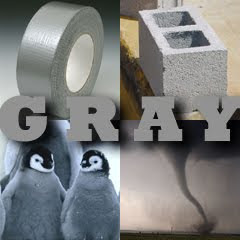 I vote for gray/gray/greige/griege because it is the color I make my living with (is that weird?) - NOT in an institution, btw, Alaina. And I love Spalding Gray (rip)and Grey Goose and Grey's and Gray's Anatomy and greyhounds and Weimaraners. I drank something in college called a Purple People Eater, now I'm a hater. Of purple. Purple, on the other hand, has some amount of sexual connotations I can't ignore. black and white are very impressive references. I have more Gray hair than purple and I would rather it be that way :) so Gray all the way. Purple is so pretty, and represents healing and lovely things. Gray is dreary, boring, and depressing. I'm staying on the dark side. Plus I cheated off of Rep's many ballots. 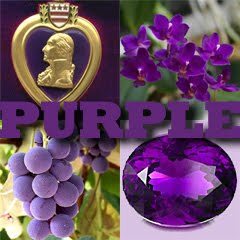 Purple is the color of royalty and since I AM gypsie royalty I must go with the color of my forfathers. Ooo, purple's resume swayed me. Go Master P.
Purple, because there's little or no confusion about how to spell it. Gray haired Pat is senile - he meant to vote for grey. Cotton Blossom votes for gray, too. Did they ever have a book called "The color gray" or make it into a movie? I'm going to have to say Purple is FAR more popular... or purpular, whatever. No no... purple it is. You are correct TS! On Facebook I voted for gray (Cottage knows me well:)but here on TNR... I'm going to have to vote for grey. I much prefer a purple haze than a gray daze. Gray dazes always leave my hair unmanageable. Purple hazes not so much. Although once when I was in the middle of a purple haze I saw a unicorn so I followed it over the rainbow and and what was the question again? Deb, that's the Purple People Eater I was talking about. Unicorns are gray, anyway. Deb votes flea bitten. I have a question for Alaina... Alaina Dear, what color did you choose for your home's exterior? Was it purple? No, no... that doesn't seem right... what was it again? OH YEAH, now I remember it was GRAY!